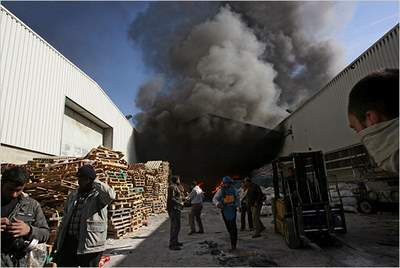 The UNRWA headquarters in Gaza was shelled by Israeli forces today, injuring three employees and setting fire to warehouses of badly-needed aid. This happened while UN chief Ban Ki-moon arrived in Israel, who commented to be "outraged". The UN operations in Gaza were temporarily suspended. The fire, which was still raging hours later, destroyed an estimated "tens of millions of dollars worth of aid," the UN spokesperson said. The UN is trying to evacuate the 700 people who took refuge in the compound. The UN claims an other phosphorous shell landed in the compound, near the fuel depot.